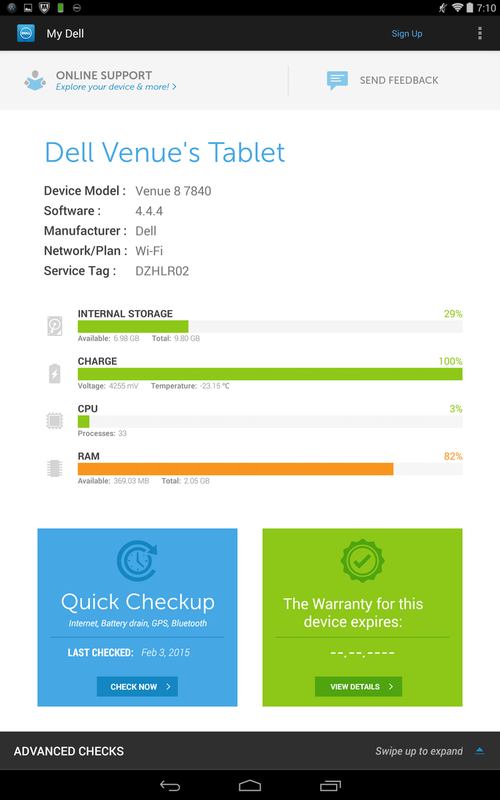 Dell started using the name "Venue" for their tablets in late 2013. Since then, we've taken a look at several different models in the series, including for example the 7-inch Android-based Venue 7 LTE, the 8-inch Venue 8 Pro and the 11-inch Venue 11 Pro. The latter two "Pro" models actually run Windows 8.1 and are aimed at business users. We've generally been pleased with the performance and the price-to-value ratio, although the slates were in our opinion if not held back, at least characterized by a rather uninspiring and somewhat generic design. No more: the Dell Venue 8 7000, which won the 2015 CES “Best of Innovation” award, eschews ho-hum styling in favor of a truly eye-catching look and packs some innovative features as well. 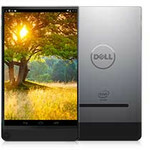 At the time of writing, Dell actually offers five different Venue tablet models, ranging from the Android-based 7-inch Venue 3000 with a low starting price of $100 to the 10.8-inch Venue 11 Pro 7000 Windows tablet with a starting price of $700. 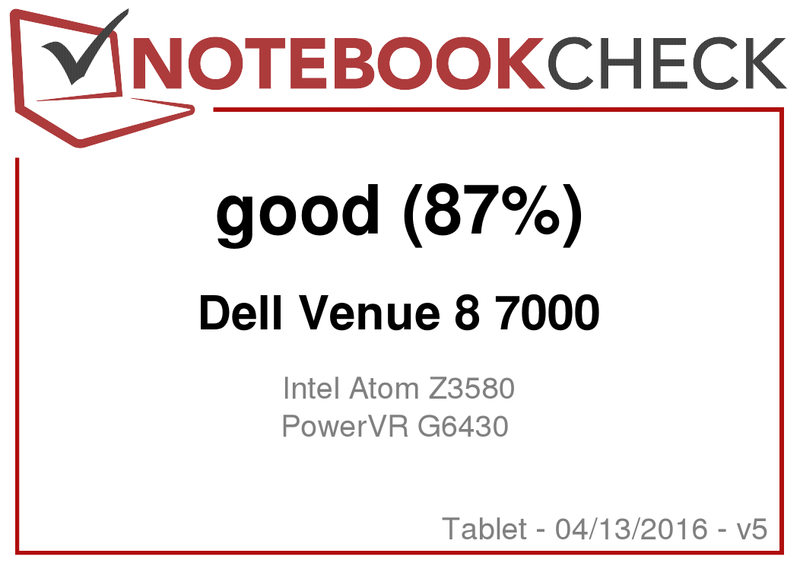 Our review tablet, the Venue 8 7000 (Dell calls this particular model Venue 8 7840), comes equipped with an 8.4-inch OLED display, an Intel Z3580 Atom processor, 2 GB RAM and 16 GB eMMC flash storage and sells for $400, which isn't exactly inexpensive by most standards. Two additional models within the 7000 Android-series feature identical hardware and include either a folio case or Dell's "Dell Cast" media streaming dongle for $440 and $470, respectively. One of the key differentiators between the Venue 8 7000 and its competition is the integrated Intel RealSense Depth Camera, which consists of a 8 MP main camera and two 720p stereoscopic cameras. Competitors are other high-resolution tablets like the 8.4-inch Samsung Galaxy Tab S 8.4, Apple's 7.9-inch iPad Mini 3, and the 8.9-inch Google Nexus 9. Let's take a look to see how the new tablet with its unique looks and innovative camera design handles our tests and how it compare to other premium Android tablets out there. 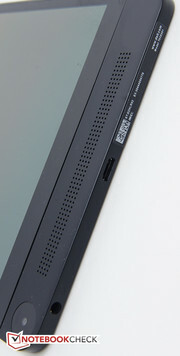 The Venue 8 7000 is a looker: while most tablets feature a curved back and sloping edges, the machined aluminum chassis of the super-slim Dell slate is flat and angular. The top corners are barely rounded at all, but the bottom corners have a slightly larger radius. Speaking of slim: the Venue 8 7000 is 6 mm thick, which makes it - sometimes only marginally - thinner than any other tablet this size on the market, including Apple's super-svelte 6.1 mm iPad Air 2, which admittedly has a larger 9.7-inch screen. 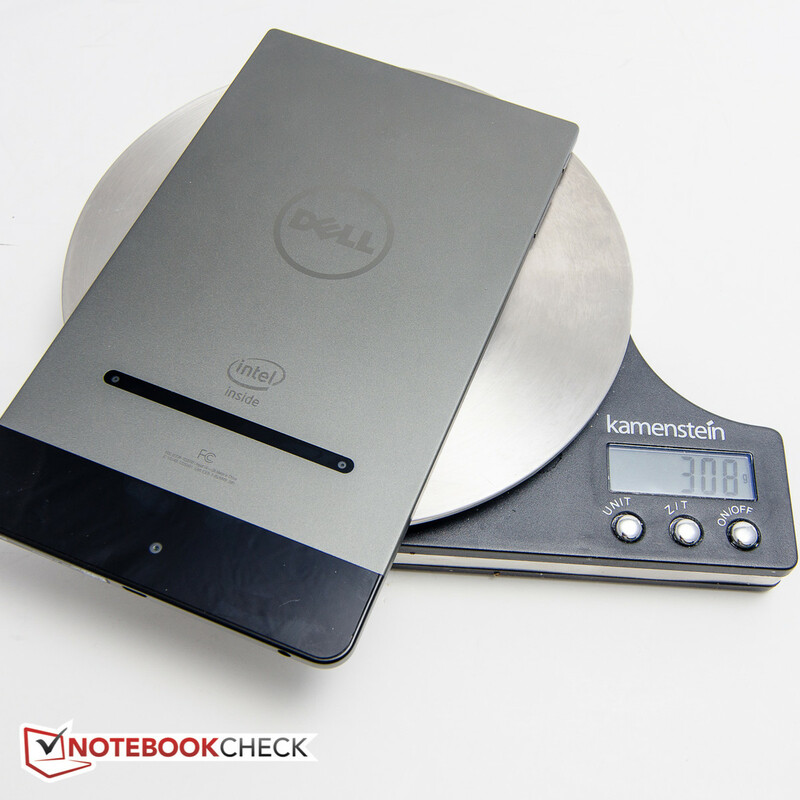 The weight is also quite low at 308 grams, which is just a few grams heavier than the Samsung Galaxy Tab S 8.4. The uniqueness doesn't end here: in addition to the extremely thin design, the Venue 8 7000 doesn't really look like other tablets, either. Instead of a more or less even, wider bezel all the way around, the tablet features extremely thin bezels up top and on the sides with only about one mm distance between the very edge and where the protective glass begins. The the bottom part is wider though at about 19 mm. The front-facing camera and the stereo speakers (under perforated aluminum) are both housed in this location. This design feature translates to a very small footprint which, as we found out, can hinder usability at times. Holding the tablet in the usual manner by its long edge with the thumb on top can inadvertently trigger touch inputs, so we found it necessary to grip the bottom section instead. Supporting the tablet that way does get tiring after a while though, but a case or folio should make holding the Venue a bit easier. Holding the Venue 8 7000 in landscape mode is quite comfortable, but unfortunately the thumb inevitably covers up the speaker grill, which impacts the sound output quite significantly. The back of the unit is solid aluminum, save for a slim cutout with a glass insert that protects the two stereoscopic cameras and a bottom bezel area which is glass as well and hides the 8 MP camera lens. 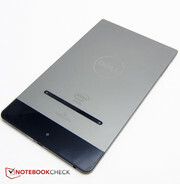 A rather large Dell logo adorns the back with an Intel logo positioned right above the strip with the two RealSense cameras. 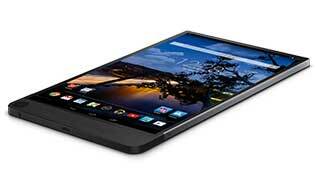 Despite the thinness the tablet is extraordinarily sturdy and twisting or bending forces have no effect whatsoever. Overall build quality is extremely high and more than appropriate for the fairly high sticker price. 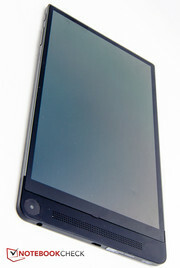 The physical on/off switch and the volume rocker switch are located on the top left edge when the tablet is held in portrait mode near the wider part that contains the camera and the speakers. The buttons have minimal travel, but offer very clear and audible feedback. The Micro-B USB 2.0 port sits at the bottom middle and the headphone/microphone combo-jack on the left bottom corner right underneath the front-facing camera. The placement of the ports impacts ergonomics: users who prefer to hold a tablet in landscape mode with their right hand will quickly discover that the location of the jack is less then ideal, since the headphone cable interferes with holding the slate. Of course, flipping the tablet by 180 degrees and holding it in the left hand alleviates the problem - and left-handed use is also indicated when using the front-facing camera, which is otherwise obscured. The MicroSD card supports up to 512 GB cards; the Micro-B USB port also supports OTG, so USB thumb drives can be used as well. 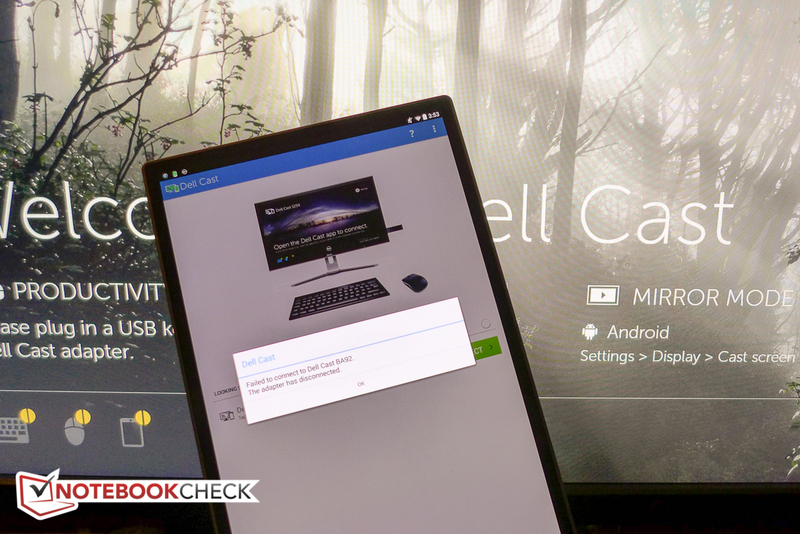 Although the tablet lacks a physical video out, the user has the option to output the tablet's content to a monitor or TV using Dell Cast, which we'll discuss in more detail below. The Intel 7260 1x1 802.11ac WLAN module supports both the 2.4 GHz and the 5 GHz band and worked reliably during the test period with no dropped connection or other issues. 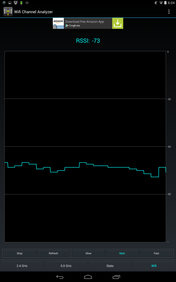 At a distance of 15 meters from our Netgear R7000 router, the attenuation fluctuated between -70 and -75 db when using the 5 GHz band, so the reception strength is good as well. 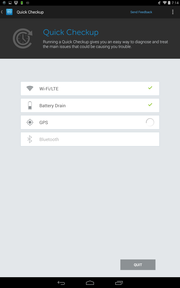 Bluetooth 4.0 is on board as well. Dell plans on releasing a version of the tablet with an Intel XMM 7260 LTE modem in May. With the Dell Cast application running and a Dell Cast adapter, the Venue tablet can bridge the gap between tablet and desktop computer by providing a wireless connection to a large monitor or TV, as well as keyboard and mouse. 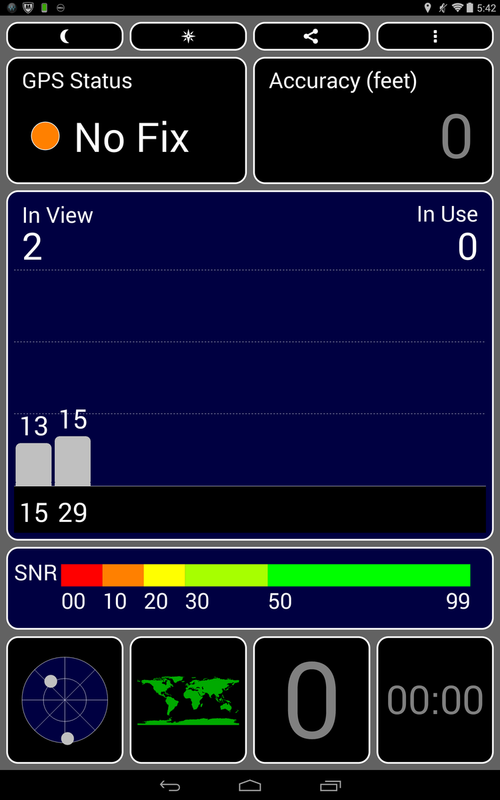 Although the GPS failed to established our location while inside - an old Samsung Galaxy Tab 8.9 had no issues and immediately had 6 satellites in view vs. 2 for the Venue 8 7000 - we had no major problems outdoors. It still took about a minute to get an accurate fix, however. 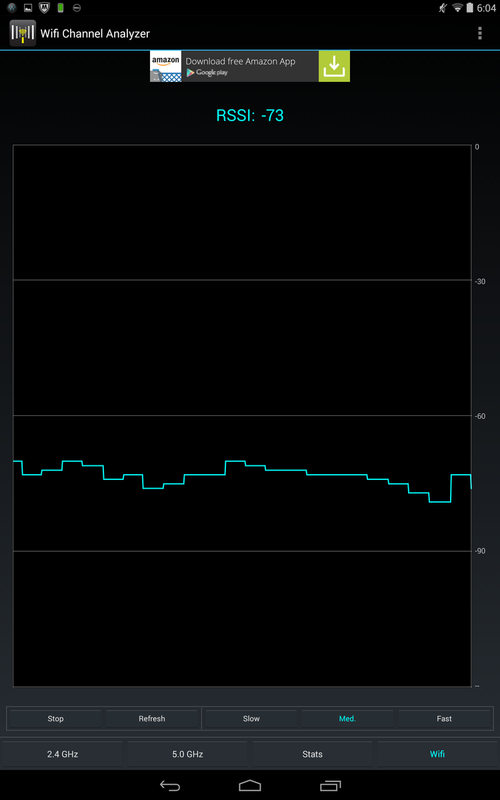 Wireless reception on the 5 GHz band 15 m from the router. 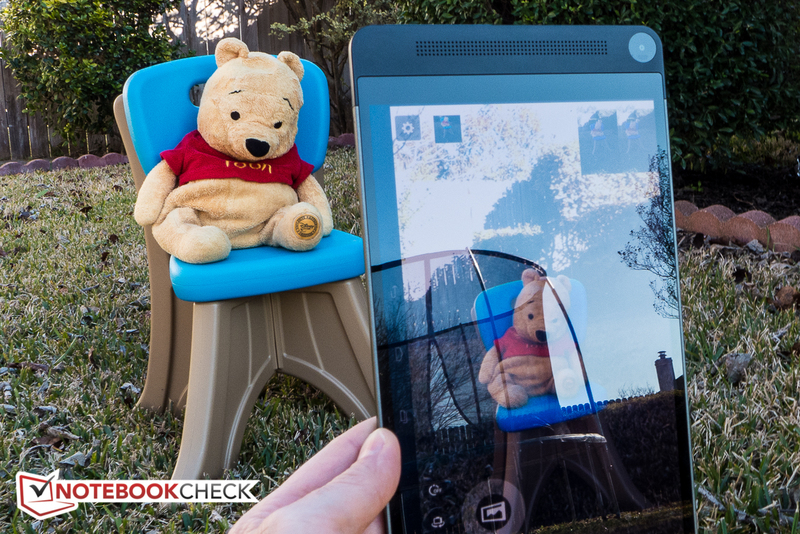 The Dell Venue 8 7000 is equipped with Intel's RealSense technology, which is supposed to allow the user to "capture photos similar to how they are perceived by the human eye". The system consists of an 8 MP main camera and two 720p steroscopic cameras arranged in a triangular fashion. The two additional cameras provide depth perception through a left and right image. 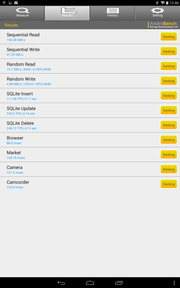 The depth info in turn is stored with each file that gets recorded. 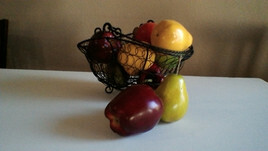 The Dell Gallery software is Dell's one-stop shop to consolidate and aggregate images from various sources (phone, Facebook, Picasa, etc.). The software allows the user to view all digital pictures in a single location without actually moving the files. The images can then be arranged in a timeline view (arranged by date), map view (arranged by location), or in a people view. The latter feature uses facial recognition software to automatically apply tags to photos of a previously tagged person. The gallery can also aggregate pictures posted on Facebook if the user was tagged in it. 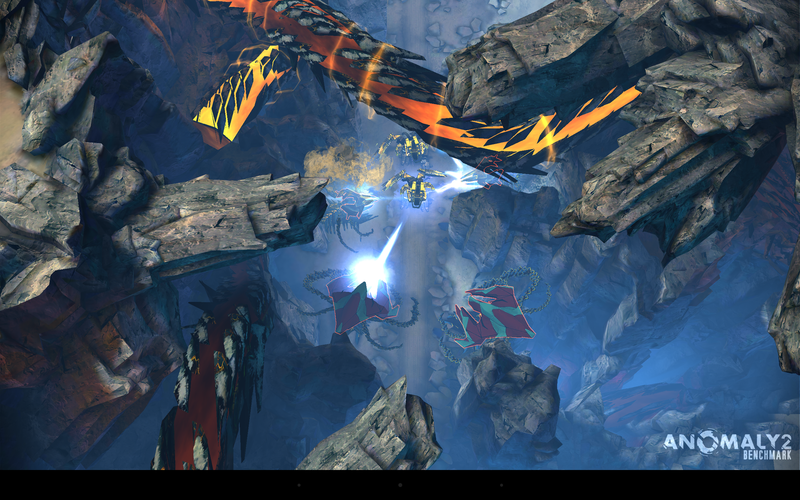 The gallery contains several tools that can take advantage of what Dell calls "3D editing". The measurement tool allows the user to capture dimensions within a photo. This process works with a varying degree of accuracy - it's a calculated estimate, not an exact value - depending on how the picture was taken. 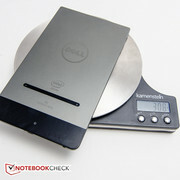 For best results, Dell recommends a well-lit object with clearly defined edges and a distance from 3 to 16 feet. Poor lighting or shooting at an angle can affect the accuracy. It's important to note that the estimates are only accurate to an inch. 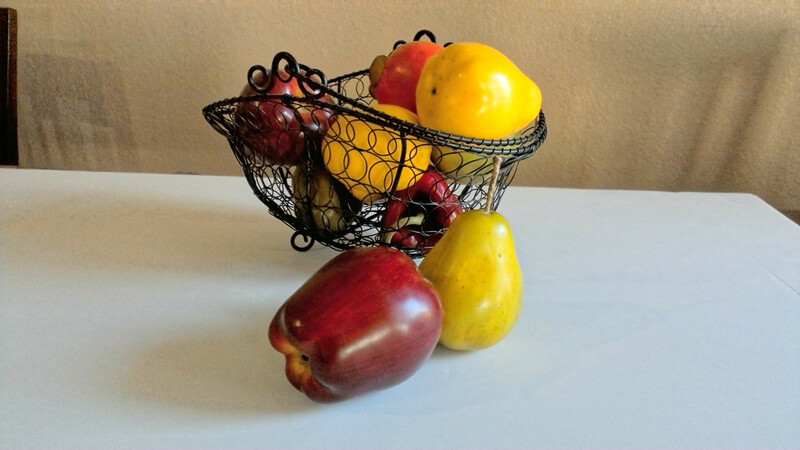 The depth editing tool makes it possible to select an item in the foreground or in the background and apply typical array of filters to as well as adjust the exposure, brightness, or contrast. 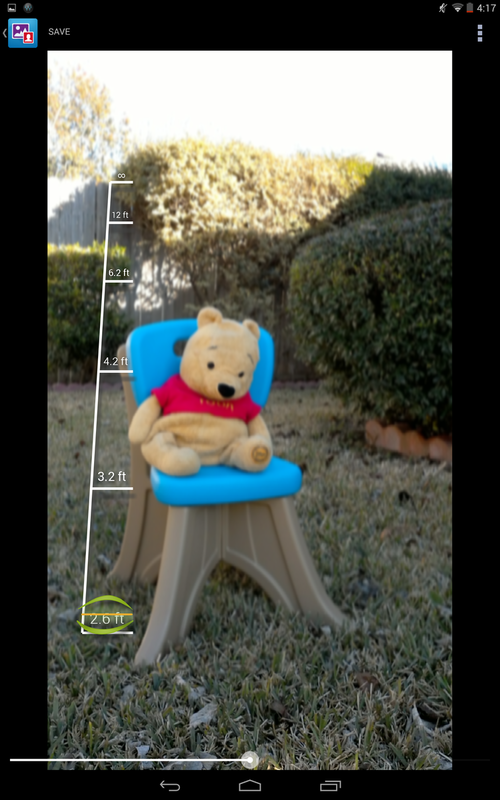 The refocus tool works similar to what is found on some smartphones and allows the focus to be changed after the photo has been taken. We found the tools quite easy and intuitive to work with and generally got very satisfying results, but we are not sure how useful they are going to be in the long run after the novelty has worn off: not only is walking around with a tablet as the primary photo tool a bit awkward, but we also found the quality of the photos to be lacking a bit. This has nothing to do with the editing, but the camera itself: the 8 MP lens produces decent enough pictures outside, but the color noise inside is quite high even in decently-lit environments. The 2 MP front-facing camera is just good enough for video conferencing, but the color noise is even more noticeable and the colors are dull and washed out. 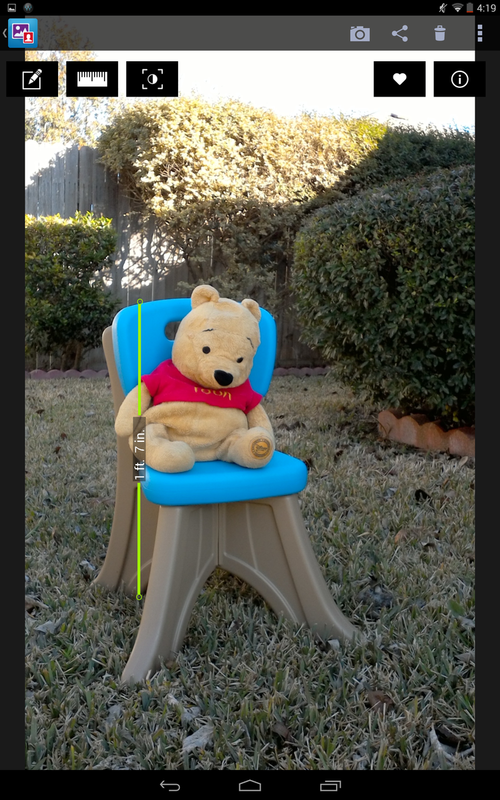 Measurement tool: the back of the chair is 20 inches high in the center - pretty accurate. 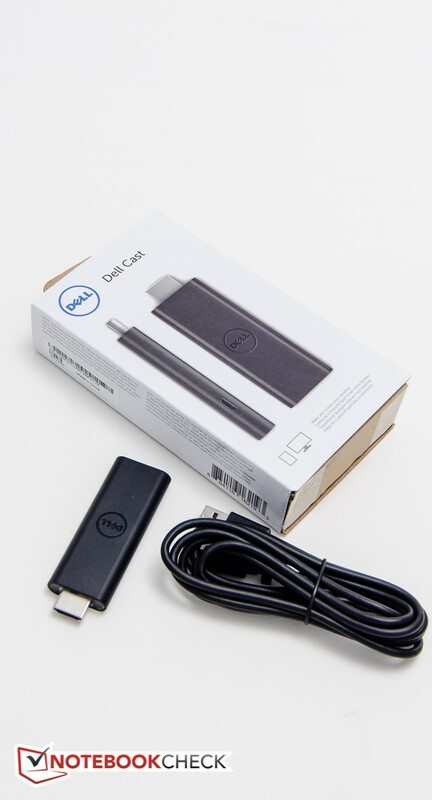 The proprietary Dell Cast technology consists of an application running on the tablet and a dongle which needs to be plugged into an available HDMI port on a monitor or TV. The streaming stick, which is powered by a dual-core Merrifield processor, supports mirroring of 1080p content via WiDi, but can also provide connectivity to a wireless keyboard and mouse. Two different modes are available: Productivity and Mirror. 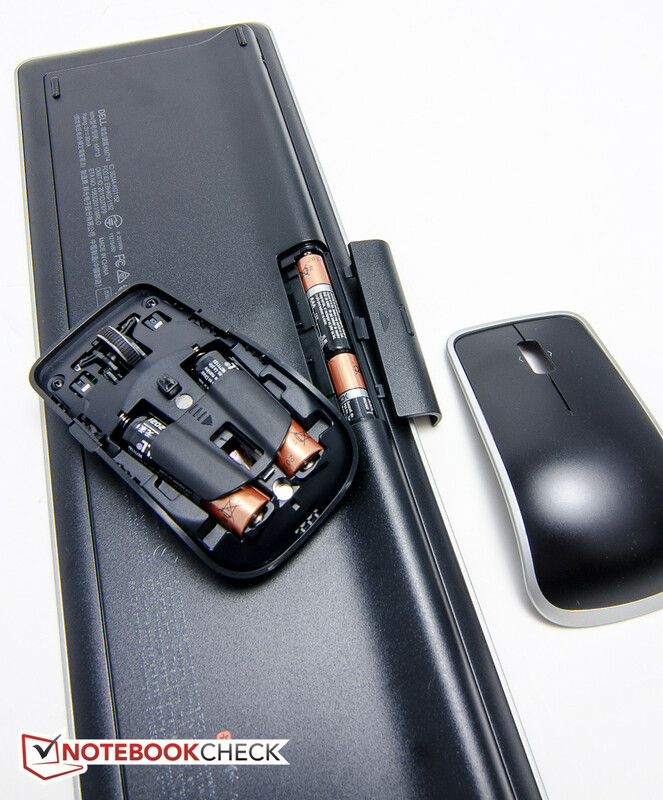 For Productivity Mode, a keyboard/mouse transceiver dongle has to be plugged into the USB 3.0 port on the other end of the device; a cabled keyboard can be used if it has a USB port to attach the mouse. 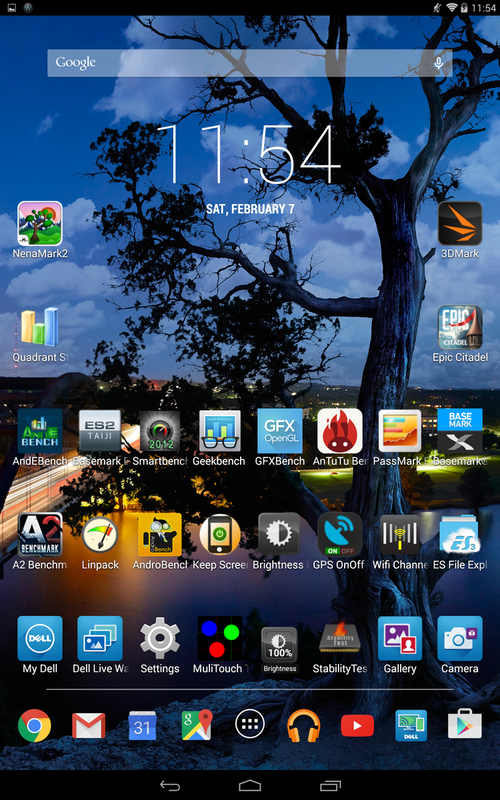 Mirror Mode uses the Android wireless display functionality to simply duplicate the tablet screen content. 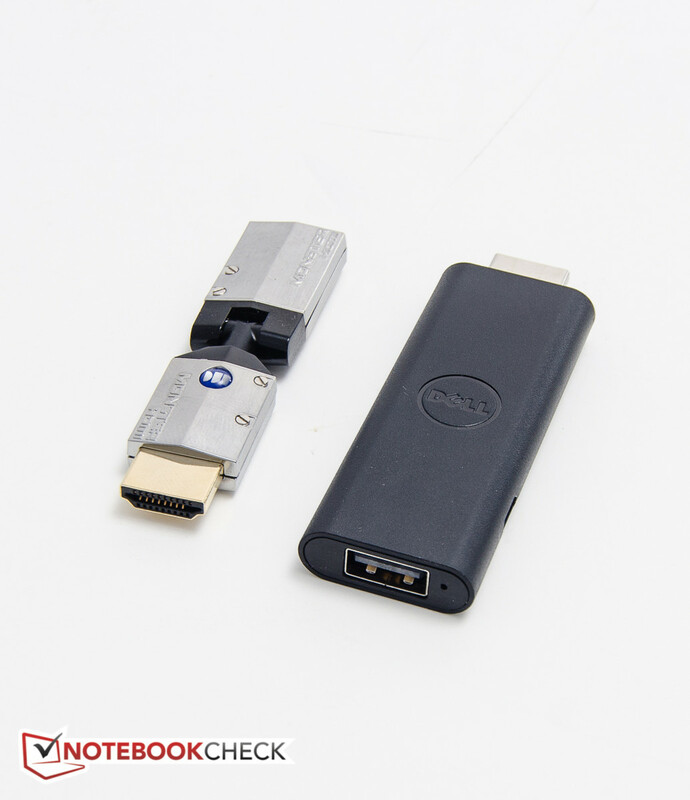 Unfortunately, we immediately ran into problems when we tried to test the setup: since the stick is about 28 mm (a little over an inch) wide, we were unable to use it on our Dell U2713HM monitor since the other connectors are too close for the dongle to plug it in. With a suitable adapter purchased, the dongle plugged into the monitor, a Micro-USB cable connected to power and to the dongle, and they keyboard/mouse transceiver plugged into it, the Dell Cast screen appeared on the monitor, giving us the choice of either productivity or mirroring. The mouse was working at this point as well. 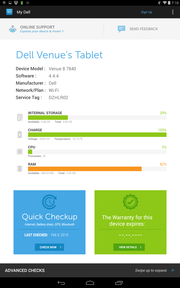 Starting the Dell Cast application on the tablet then initiates the search for suitable adapter. The connection unfortunately failed every time we tried it with the message "the adapter has disconnected". 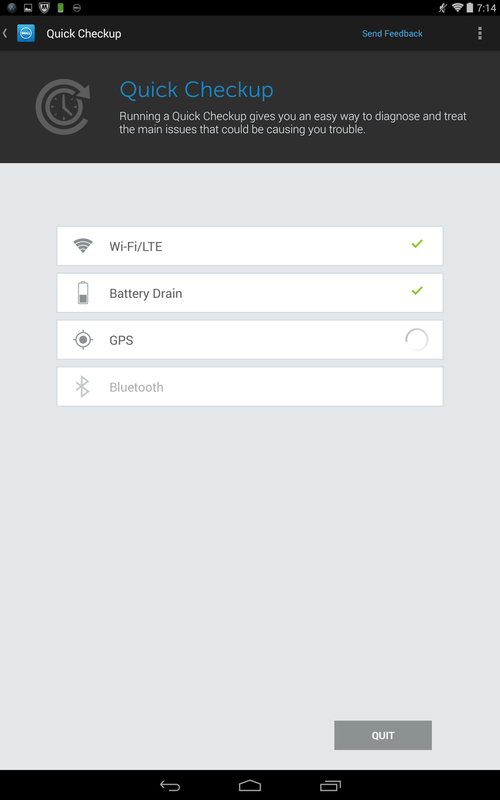 For Mirror Mode, the user needs to open the Android settings menu. After selecting "display" and "cast screen" (with "enable wireless display" checked), the Dell Cast dongle name then appears. The connection failed here as well with the message that a suitable adapter couldn't be located. At this point we can only suspect a defective adapter; we will update this review once the issue is resolved. The Venue 8 7000 runs the now outdated Android version 4.4.4 KitKat, build BBP803A135500DEL. 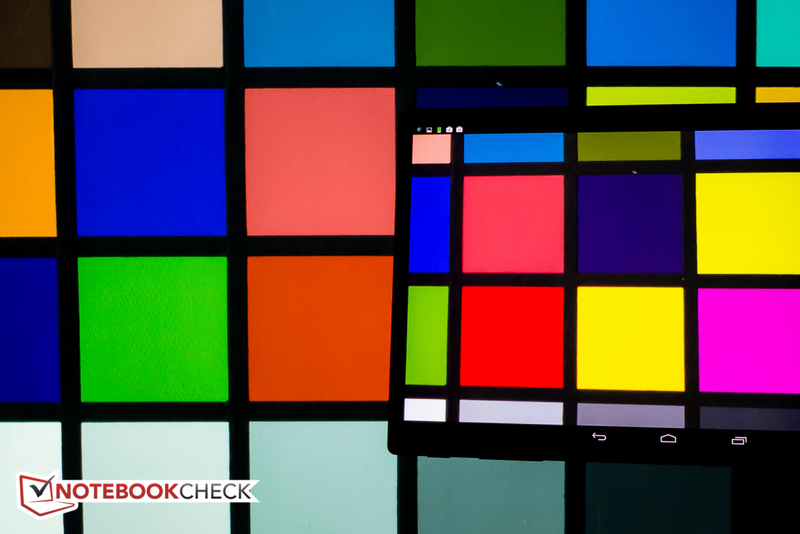 At the time of writing, we don't know when an update to Android 5.0 Lollipop will be available. 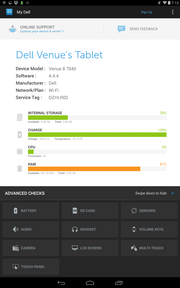 In addition to the usual pre-installed applications like Google's app-package, Dell has also included a diagnostic app called "My Dell", which gives general information about the tablet, including internal storage, charge status, and CPU and RAM usage, but also provides a "quick check" shortcut to test WiFi, battery drain, the GPS, and Bluetooth, as well as "advanced checks" for the screen, sensors, and camera, among others. The box included the device itself, the power adapter, and the USB charging cable. The version of the tablet retailing for $440 also includes the Dell Cast Dongle, which can be purchased separately for $60. In our case, Dell also included the KM714 wireless keyboard and mouse combo to use with the Dell Cast adapter ($60). 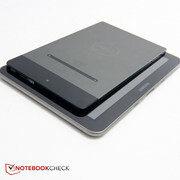 Other available accessories include the Dell Bluetooth Portable Speaker, a Targus sleeve, a Targus Stylus ($16), the Dell Venue Folio ($50), and the Dell Venue Keyboard Folio ($90), which provides a case that folds into a stand and a wireless keyboard which uses Bluetooth to connect. The Dell Venue 8 7000 is covered against defects for a period of 12 months. This is a mail-in warranty and the customer has to supply a box as well as pay for shipping. Warranties covering accidental damage can be added for 12 months ($29), 2 years ($59), and 3 years ($90). 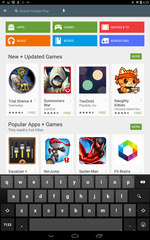 Dell uses Google's standard Android keyboard as the default. The 8.4-inch screen is large enough to comfortably type even when in portrait mode. Keyboard sounds can be enabled, but haptic feedback is not an option since the Venue does not contain a pager motor. 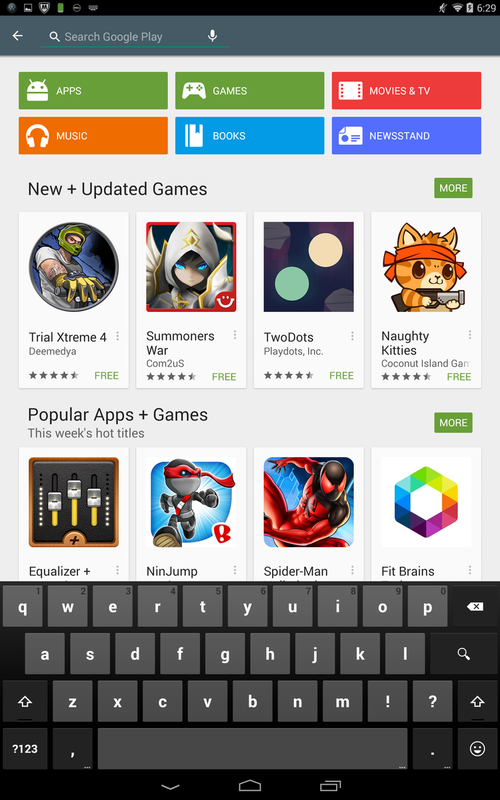 Additional keyboards can of course be downloaded from the Google Play Store, if so desired. The capacitive touchscreen can detect up to ten simultaneous touch inputs. The screen worked very well during the review period and our inputs were promptly recognized and translated accurately. As we mentioned earlier, care needs to be taken when holding the tablet, since the touch-sensitive area starts a mere 5 mm from the outside edge of the device.The glossy glass panel does attract finger prints, so it's a good idea to keep a cleaning cloth handy. 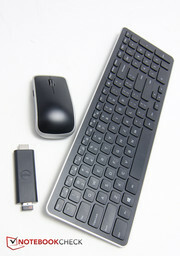 Since the Dell Cast dongle has a USB port, a regular wireless keyboard and mouse can be used as well. Operation is of course much faster that way and should enhance productivity. Dell shipped us their KM714 combo, which comes with a Logitech Unifying receiver. 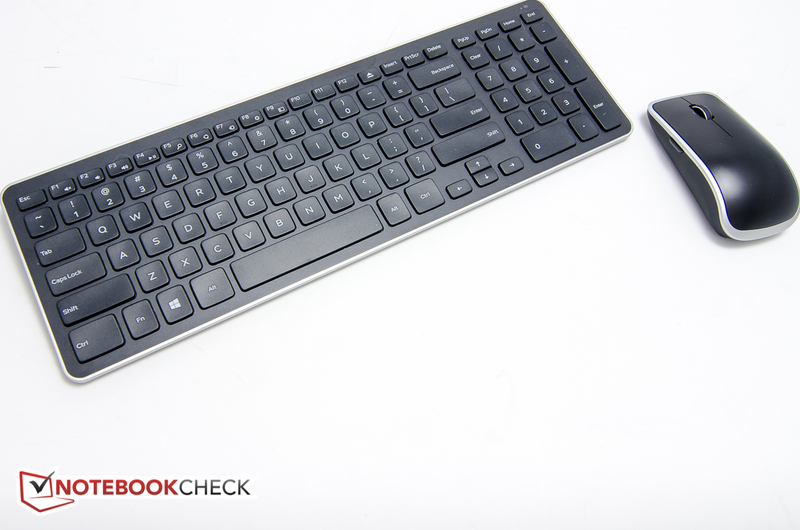 The slim-line keyboard features a separate numeric keypad and chiclet keys with a fairly short drop of 2 mm but decent feedback nonetheless. The keys are on the small side at 14 x 14 mm, but since they are sculpted and have almost 4 mm distance between each other, we were able to type at a good clip without major errors. We also appreciated that the keyboard is raised in the back, as it is much more comfortable to type on. The upper function row features half-sized keys (the arrow keys are half-sized as well), which we found to be a bit of a let-down, since important keys like the delete key also reside in that row. The mouse has a side button and a tilting scroll wheel, so it should work well with a Windows tablet to access the charms menu or to switch apps and navigate web pages. 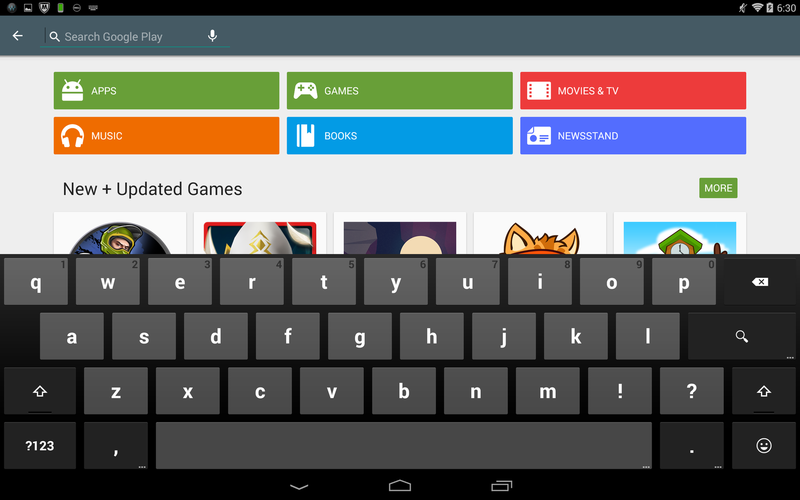 The keyboard in landscape mode. 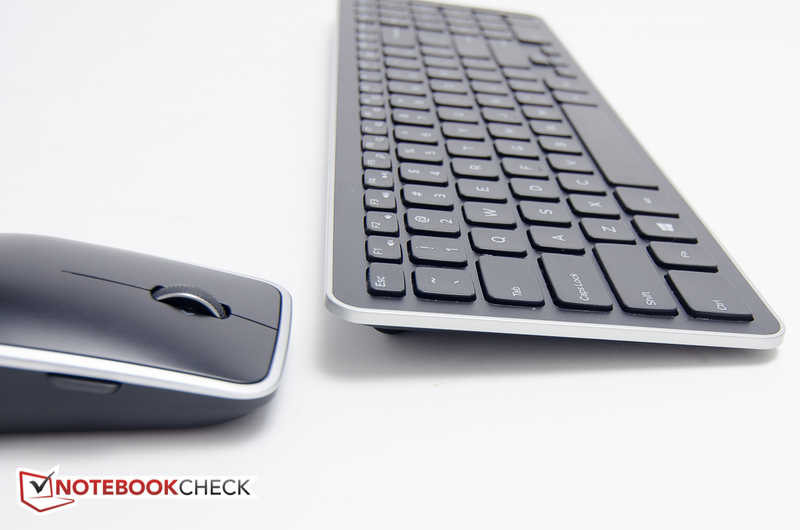 With the Dell Cast dongle, a regular wireless desktop keyboard and mouse can be used. The Dell KM714 keyboard and mouse combo. The Venue 8 7000 sports an OLED 8.4-inch WQXGA display with a resolution of 2560x1600 pixels, aspect ratio of 16:10, and a corresponding pixel density of 361 PPI. The 8.4-inch Samsung Galaxy Tab S 8.4 features the same screen size and resolution; Samsung Galaxy Tab S 8.4 Tablet ReviewApple iPad Mini 3 Tablet Reviewthe 8.9-inch Google Nexus 9 and the 7.9-inch Apple iPad Mini 3 make do with a slightly lower resolution as well as pixel count. While having such a high resolution sounds very good on paper, this clearly is a case of "too much of a good thing" as we did find ourselves wishing for fewer pixels at times. Having ample screen real estate is great, but not all apps are optimized for such a high resolution and and choosing "large text" in the Android system settings is not necessarily an answer, as it can lead to cut-off letters in the launcher and doesn't work for all apps. With the font size at its default setting, the labels and text in some applications are sometimes incredibly difficult to read. 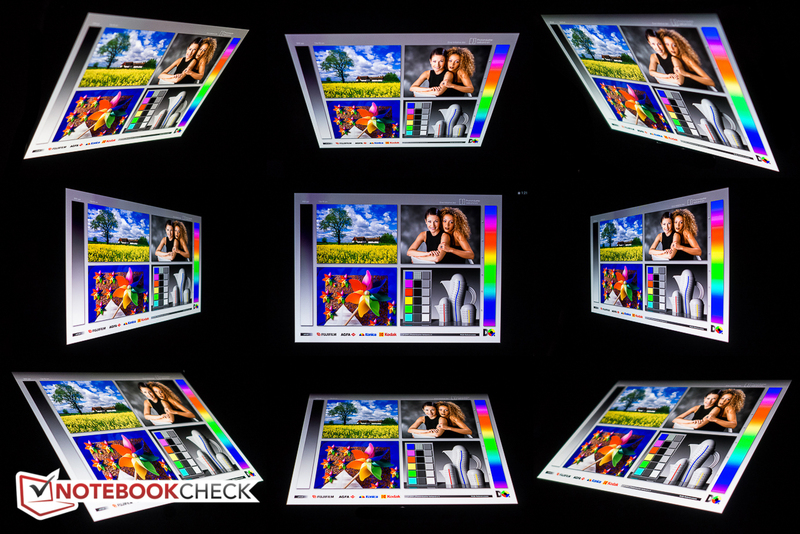 With an average brightness of 240 nits, the display brightness of the Venue 8 7000 falls short of its competitors. The Samsung Galaxy Tab S 8.4, which is also not very bright unless set to automatic brightness, reaches 260 nits, while the screen of the Nexus 9 is almost twice as bright as the one our review tablet is equipped with. The brightness distribution is also far from great at 84 % and the screen is brighter towards the speaker/camera side when the tablet is held in landscape mode. During normal use this is not really noticeable, however. OLED displays do not use a traditional backlight, so the corresponding black value is 0 nits and the contrast ratio theoretically infinite. This means that blacks actually are truly black and not displayed as gray, which is immediately noticeable when watching video clips. 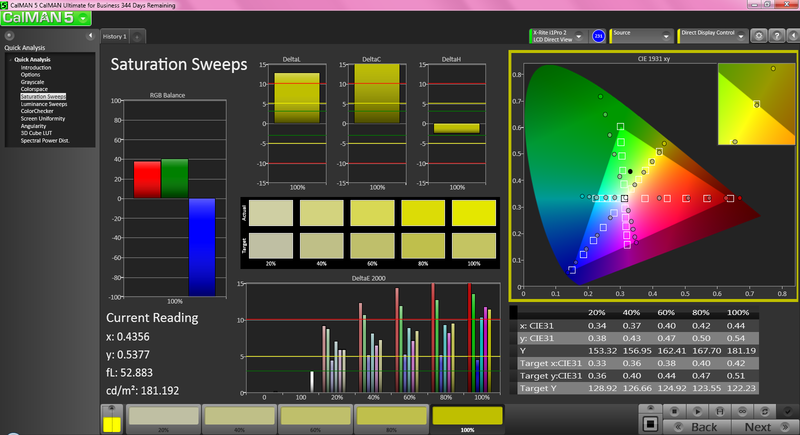 An analysis of the color reproduction capabilities shows a fairly high average and maximum DeltaE-deviations for color of about 7.5 and 14.4, respectively. 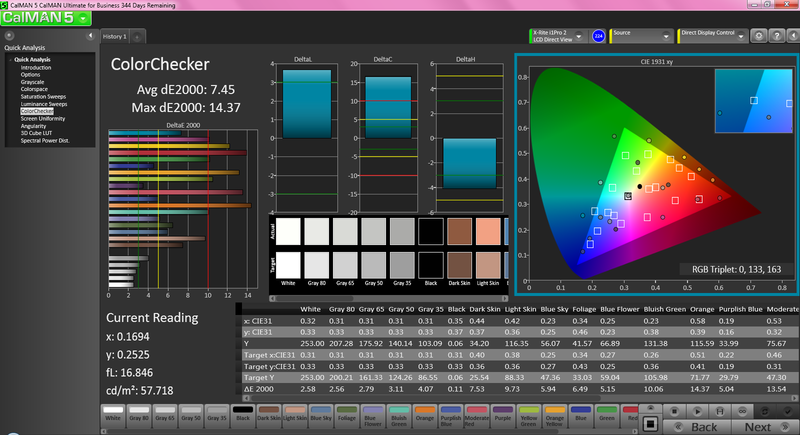 The image on the right shows the tablet next to a Dell U2713HM in sRGB-mode displaying the same photo of a color chart. Although far from a scientific test, the comparison shows that red is particularly vivid. 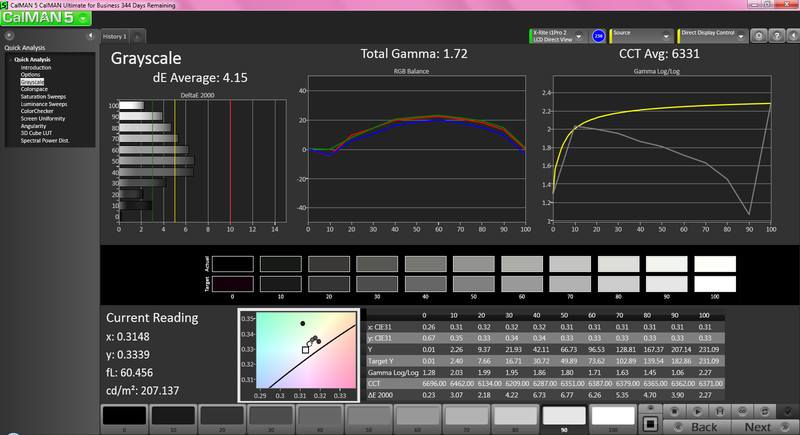 Graylevels, on the other hand, are good at an average DeltaE of 4.15. 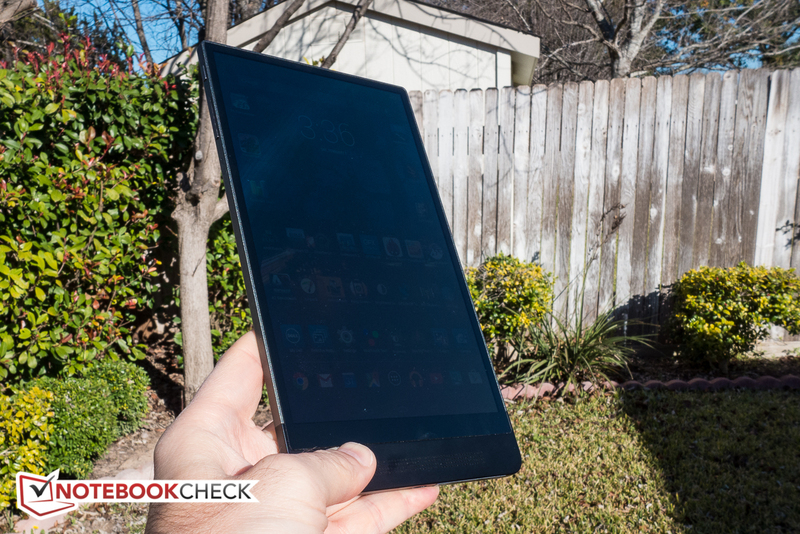 Although the Samsung Galaxy Tab S 8.4 clearly has a superior OLED display, the screen of the Dell Venue 8 7000 still provides a very good overall viewing experience and is pleasure to look at despite the less than stellar measurements. Despite the comparatively low brightness, the Venue 8 7000 is still quite usable outdoors thanks to the superb contrast ratio. Direct sunlight is of course out of the question, but we had no issues operating the tablet in the shade. 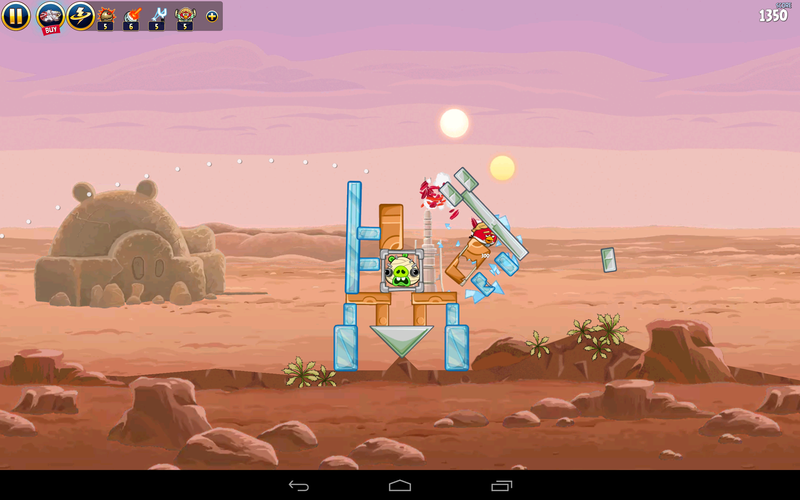 A semi-glossy or matte screen would do wonders though in reducing the annoying reflections in brightly-lit environments. 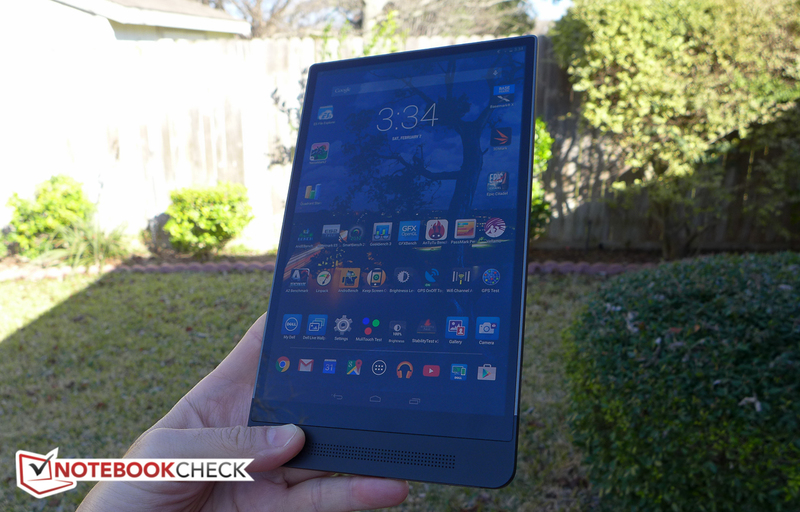 The viewing angles stability of the Dell Venue 8 7000 is very good as well. 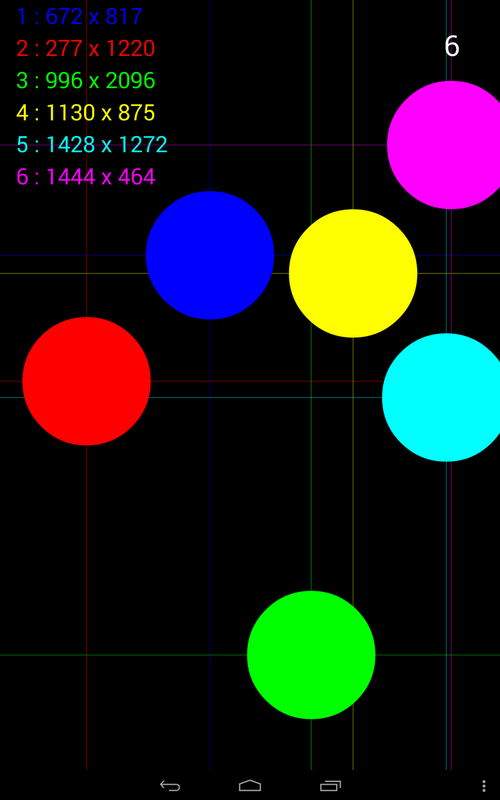 Although we saw a slight decrease in brightness at very shallow angles, the colors generally remained stable no matter which direction we tilted the tablet. Sharing the screen content with another user is definitely possible without problems. Dell sticks with Intel as far as the CPU is concerned and outfits the Venue 8 7000 with the Intel Atom Z3580 SoC. This power-efficient quad-core CPU, which is part of the Moorefield platform, can reach clock speeds of up to 2.33 GHz in burst mode. Although the dual-channel LPDDR3-1600 memory controller supports up to 4 GB of RAM, Dell integrated only 2 GB. 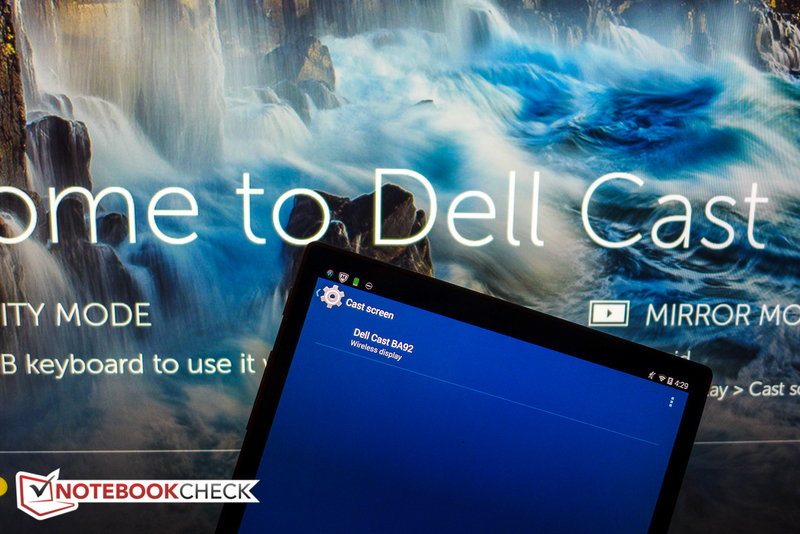 From our experience, it is fairly easy to use upwards of 80 % of the available RAM when multitasking, so Dell could've been more generous here in our opinion. 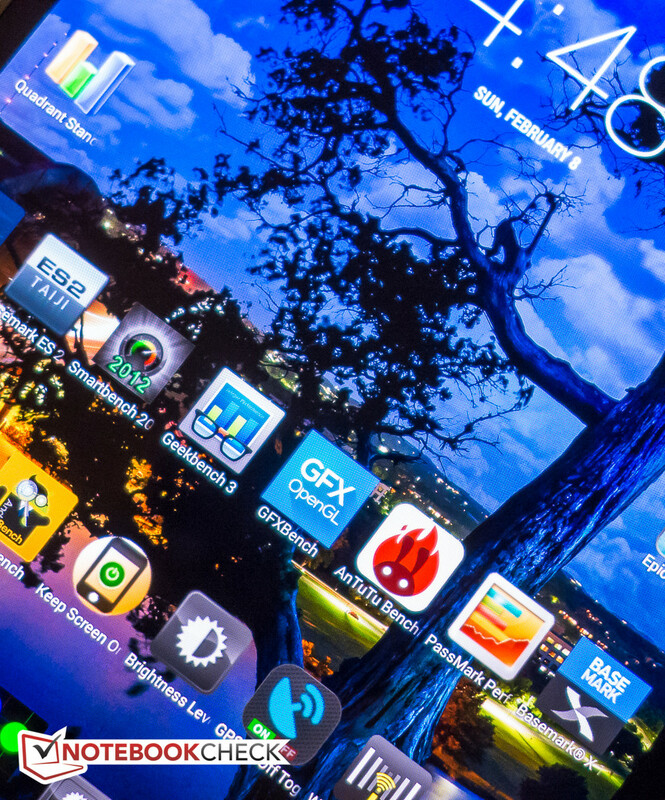 Other premium tablets, like the Samsung Galaxy Tab S 8.4, come with 3 GB of RAM. The graphics unit is not from Intel but comes from Imagination Technologies. 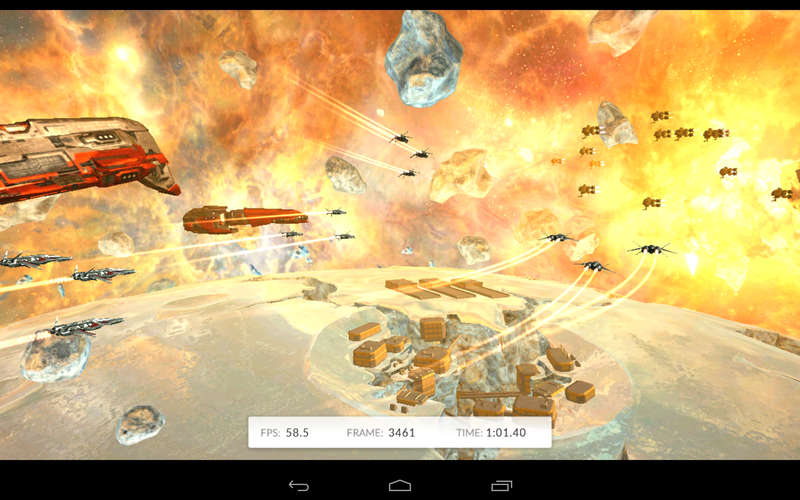 The PowerVR G6430 can also be found in Apple's A7 processor (see our review of the iPad Mini 3) and is a powerful GPU solution for this class. Performance is pretty good overall: in the single-core portion of the Geekbench 3 benchmark test, our review tablet performs exactly like the Samsung Galaxy Tab S 8.4 with the Exynos 5420 Octa CPU and ARM Mali-T628 MP6 GPU; the Apple iPad Mini 3 with its 64-bit A7 CPU performs over 45 % better. The multi-core performance is once again similar to the Samsung, but this time ahead of the iPad Mini 3 (~ + 20 %), which is only equipped with a dual core processor. 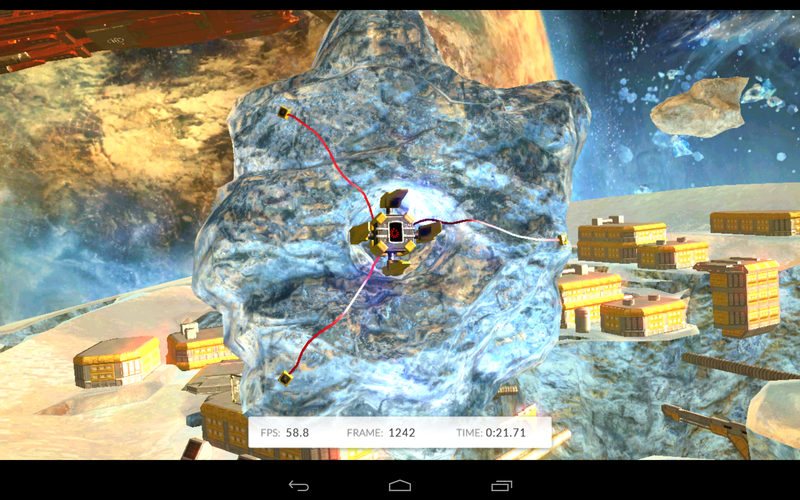 The results of the graphic-intensive 3DMark 2013 Ice Storm Unlimited are pretty compelling: the Venue 8 7000 manages to distance itself from the Galaxy Tab S 8.4 by a fair margin (about 50 % better performance). 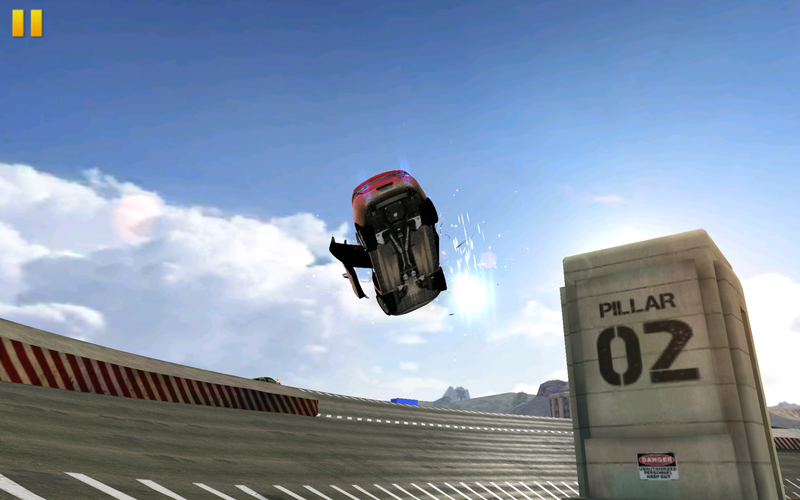 Apple's iPad Mini 3 generally offers less performance as well even though it is equipped with the same GPU. The most likely reason: the clock speed in Apple's implementation is a bit lower. 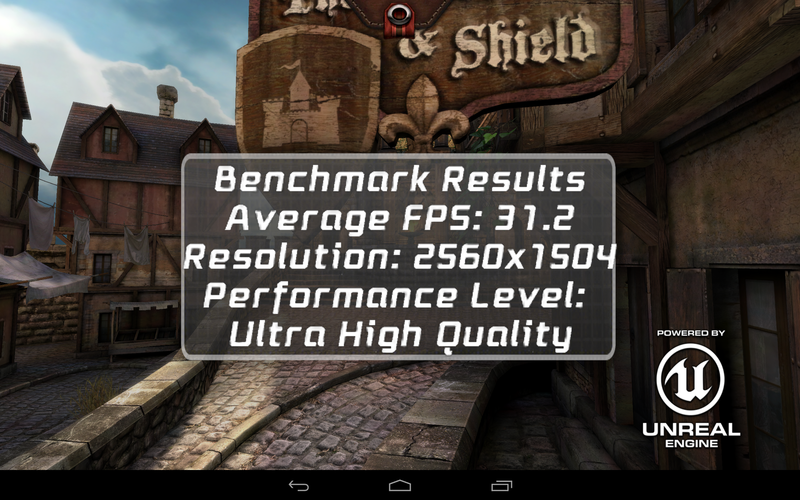 The performance of the Nvidia Shield Tablet with Tegra K1 Kepler GPU remains untouched. The browser performance of the Dell Venue 8 7000 is quite good as well and very similar to the also very quick Google Nexus 9. 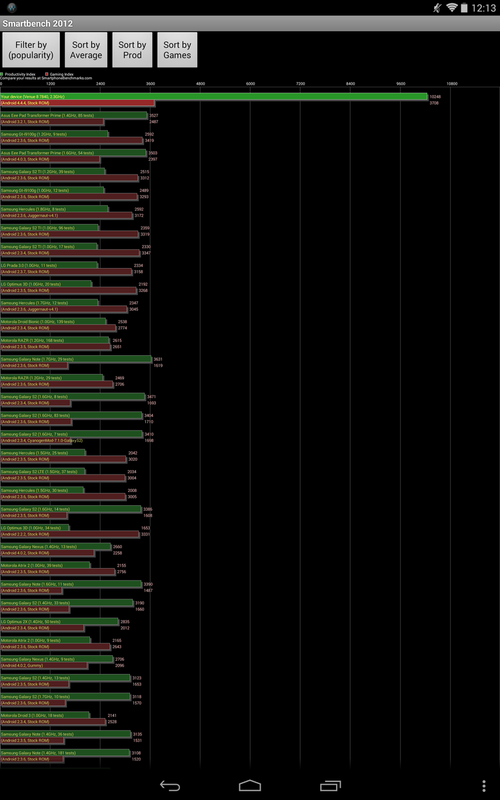 Subjective performance is quite snappy: pages load quickly and browsing is generally a very satisfying experience. 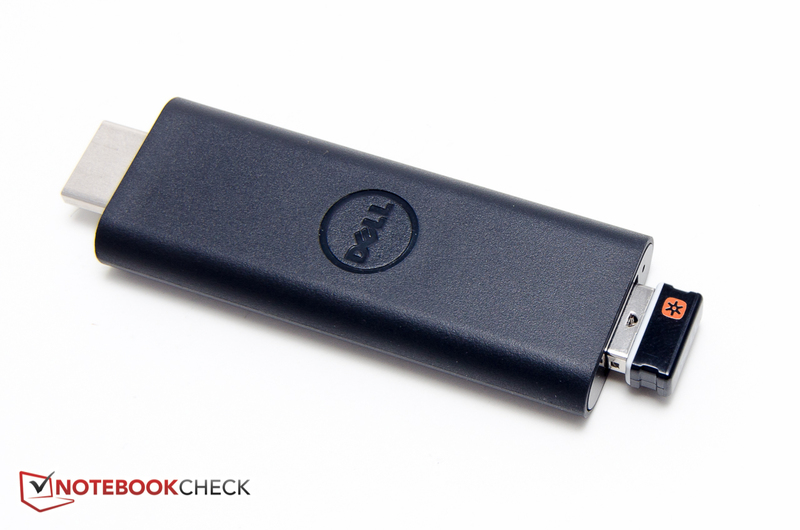 Dell only offers the Venue 8 7000 with a 16 GB eMMC flash drive. 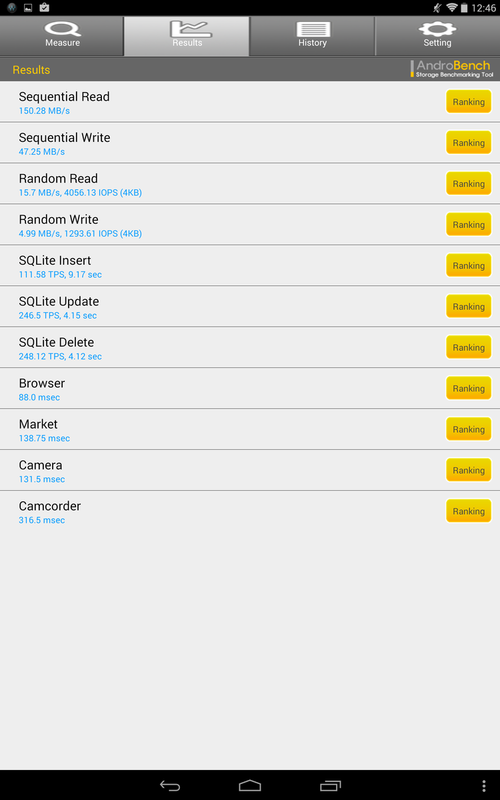 The performance is very good across the board and only trails the Google Nexus 9 in every category in the Androbench 3 benchmark test. 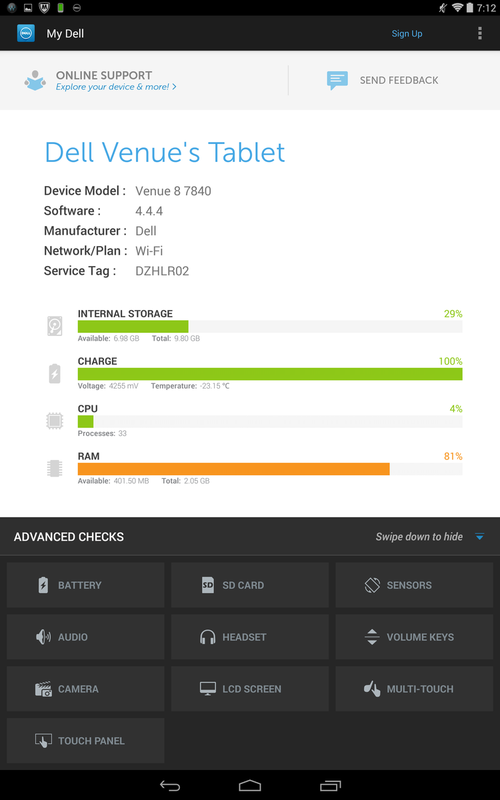 Although storage can be expanded using a MicroSD card, we would appreciate if Dell could at least offer a 32 GB version of the tablet. 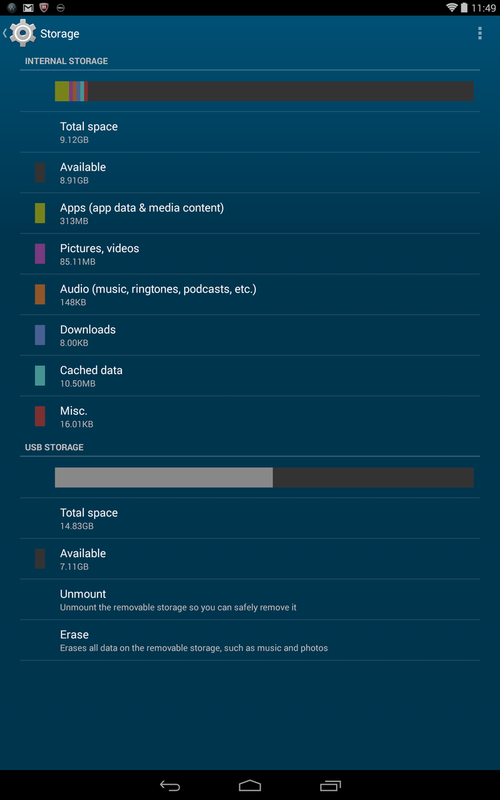 As is, only about 9 GB of the 16 GB total are available to the user. Based on the decent synthetic benchmark scores, most games shouldn't tax the Venue tablet too much. 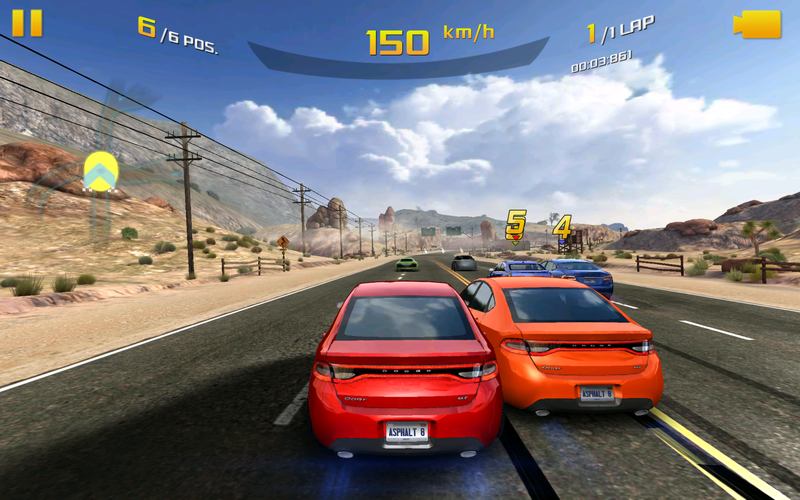 And indeed: even Asphalt 8, which is a more demanding title, ran at medium details and remained perfectly playable without any lags or stutters. 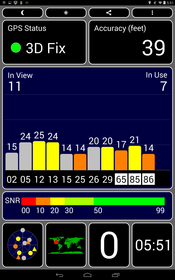 The Venue 8 7000 only reached a maximum of 25 °C during idle, which is an excellent result. The Google Nexus 9, as an example, runs a good 10 °C hotter; the Galaxy Tab S 8.4 and the iPad Mini 3 reached 31 °C and 32 °C, respectively. During the stress test, the Venue topped out at just over 31 °C maximum, which is far lower than the other tablets in our comparison. Next closest is Apple's iPad 3 at 37 °C, the other two tablets reached almost 40 °C. Even though the warmest area is in the bottom section on the back near the speakers and the webcam - which is where we ended up holding the tablet in portrait mode - the maximum temperatures remain so low that even extended use poses no problems whatsoever. The stereo speakers sit under a perforated grill on the right above the Micro-USB connector. The sound quality is surprisingly good for such a thin device and even sufficient to listen to music every so often. The MAXX audio software allows the user to choose different settings for gaming, music. 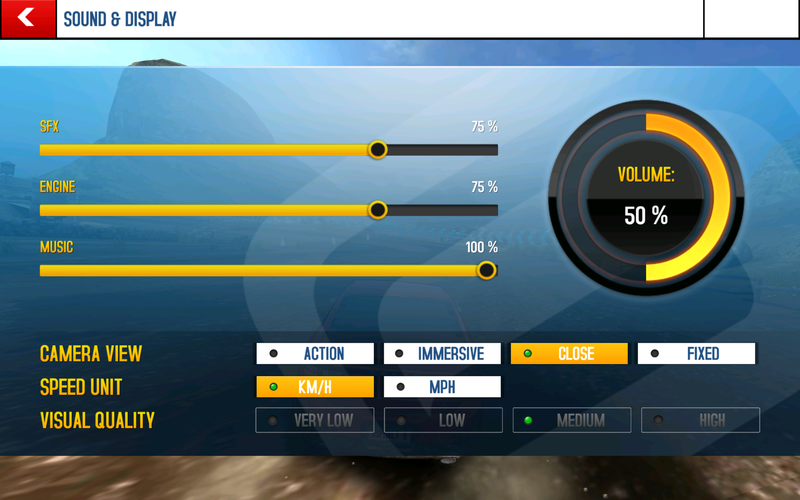 voice, or videos and offers an equalizer as well for manual control. 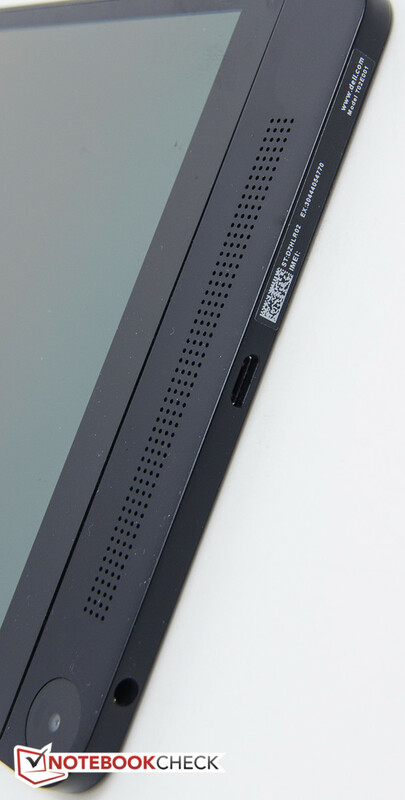 As we pointed out earlier, holding the tablet at the section with the large bezel and thus the speakers area means that the user's thumb will cover up part of the speaker grill, which leads to muffled sound. There is one other issue with the speaker placement: when watching movies, the tablet is likely to be held or propped up in landscape mode. The speakers are now either to the right or to the left of the screen, which reduces the stereo effect. 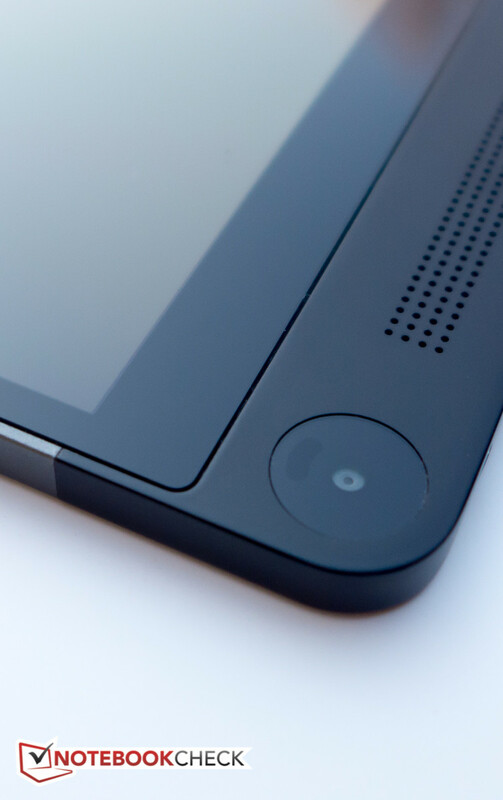 The Google Nexus 9 has one speaker on the top edge and one on the bottom, which works better in this scenario. The Venue 8 7000 comes with a 5900 mAh battery which provides 21 Wh. The Google Nexus 9 (25.5 Wh) and the Apple iPad Mini 3 (24 Wh) both have larger batteries; the Samsung Galaxy Tab's battery has a lower capacity of under 19 Wh. The idle runtime with the screen brightness turned all the way down and wireless disabled was outstanding at nearly 30 hours. The minimum run time with all wireless modules and the GPS turned on was equally impressive at about 6hours and 45 minutes. We need to point out here that the Venue doesn't get as bright as the other tablets, which helps explain the longer battery life. 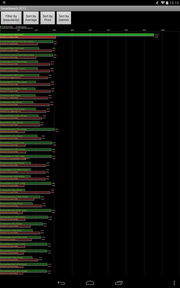 For a more relevant comparison, we set the screen brightness to 150 nits and start a script which simulates web browsing by loading different sites every 40 seconds. During the WLAN test, the Venue lasted 8 hours and 15 minutes, which is a bit shorter than the competitors, but still quite acceptable. 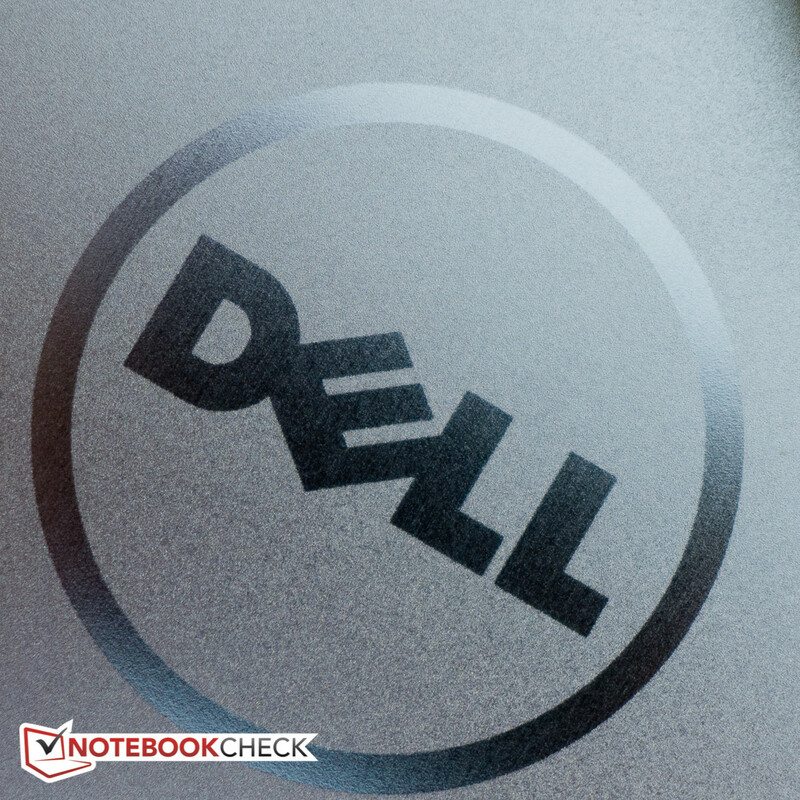 Dell specifies a battery life of 10 hours, which should be attainable with the screen brightness minimized. Charging is a fairly slow affair: even with the tablet off and with the supplied 10-watt power adapter plugged in, we usually had to wait around 4 hours before the Venue was fully charged. 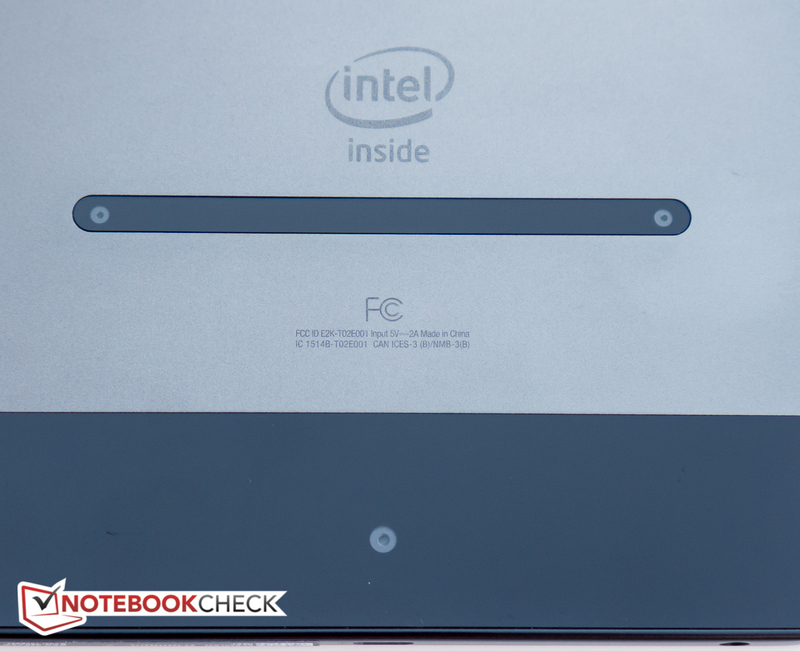 Overall, the Dell Venue 8 7000 is a compelling choice and a pretty decent value despite the high sticker price - especially when compared to the all-plastic 8.9-inch Google Nexus 9. 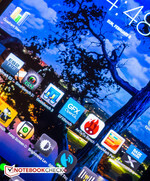 The Samsung Galaxy Tab S 8.4 offers similar performance and a similar price point as well, but has a superior screen. Apple's 7.9-inch iPad Mini 3 will remain a popular choice for users who prefer iOS instead of Android. Speakers: Stereo speakers with MaxxAudio Waves tuning, Keyboard: Virtual, Keyboard Light: no, 12 Months Warranty, Intel RealSense Depth camera with one 8 MP camera and two 720p stereoscopic cameras. ...and a WQXGA display with a resolution of 2560x1600 pixels. 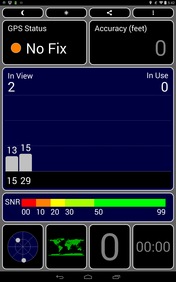 ...but the performance of the eMMC flash drive is quite decent. The high pixel count can make it very hard to decipher text. ...is too wide to plug into some monitors, so an adapter might be needed. ...and Mirrorcast unfortunately didn't work, either. The front-facing 2 MP camera offers mediocre quality. 308 g - not exactly heavy. 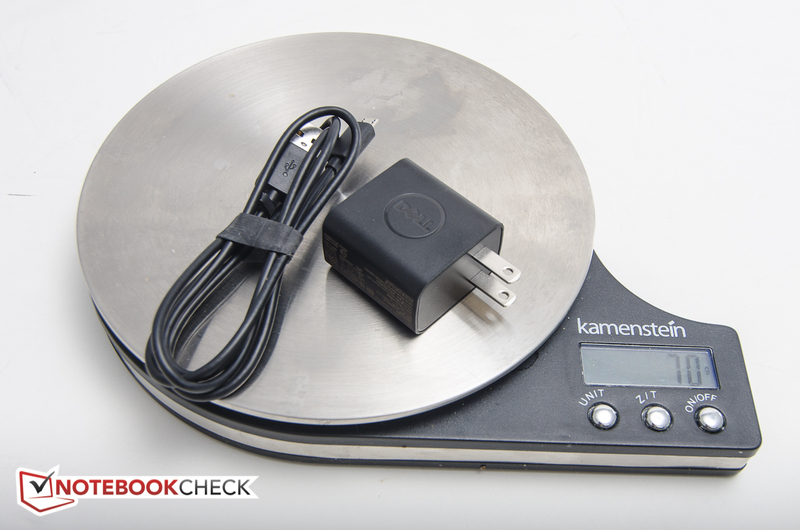 The power adapter and cable weigh 70 g.
...but also has integrated diagnostic tools. The stereo speakers hidden under the perforated aluminum sound surprisingly good. 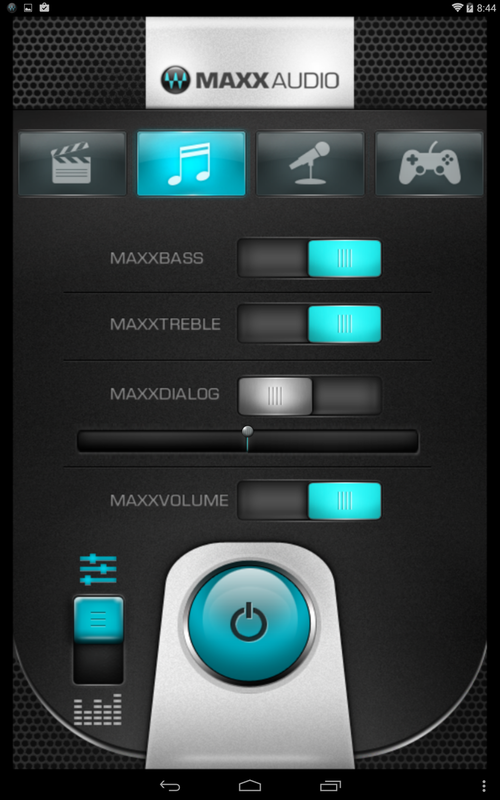 The MAXX audio software allows the user to tweak the sound settings. Up to 10 fingers are recognized. The display could be a bit brighter and 16 GB of storage are really not quite enough these days. 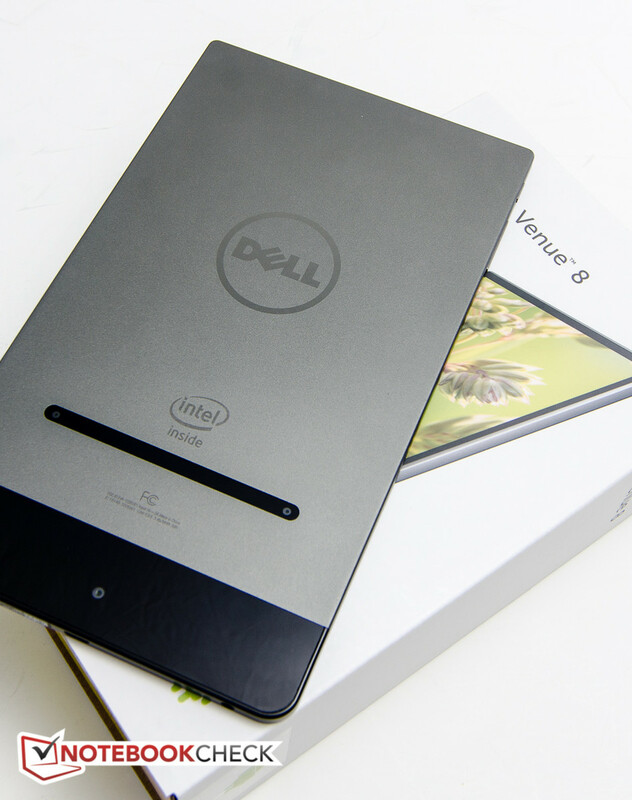 Dell creates a tablet that breaks design convention - and it looks good as well. The 8.4-inch Samsung Galaxy Tab S 8.4, Apple's 7.9-inch iPad Mini 3, and the 8.9-inch Google Nexus 9.